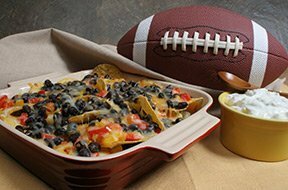 This casserole-like method of preparing nachos is so easy to do and so delicious. Top it with a jalapeno sour cream mixture for a terrific blend of Southwestern flavors. This dip recipe is perfect for your Super Bowl party or any special celebration with friends and family. Do you want to serve some special burgers at your Super Bowl party? We have plenty of tips and ideas to make them a Super Bowl hit. Do you have trouble getting the bacon crispy enough on your wraps? See this tip for perfect bacon wraps.